I will introduce 'Shodo',Japanese calligraphy in this page. Calligraphy is a creative art expressing the beauty of letters by handwriting. Japane originally didn't have its own lettes, so the history of calligraphy is also the history of letters at the same time. Chinese characters were imported from China in 7th century as well as Buddhism. So, copying the Buddhism sutra became popular, and calligraphy developed. From 8th-9th century, missions to China brought Chinese culture and Chinese calligraphy became the example. But according to the declination of To Dynasty in China, mission was abolished and Japanese culture was established. In this movement, Japanese character 'Hiragana' was created. At first, 'Manyogana', using Chinese character to express the Japanese pronunciation was born. There was more than 1,000 Manyogana characters. Then, 'Sogana' was made by arranging Chinese character in cursive style. And 'Katakana' was created by using a part of Manyogana, and 'Hiragana' was also created by simplifying Manyogana. These Katakana and Hiragana are used as well as Chinese characters now. In Kamakura era (13-14th century), again calligraphy came from China. The strong writing called 'Bokuseki' gave an impact to japanese calligraphy writers. After that calligrphy is devided into two styles, Japanese style and Chinese style. The sentece mixed with Chinese and Japanese characters became common at that time because it is more practical. In Muromachi era (14-16th century), calligraphy declined, but in Azuchimomoyama era (late 16th century), by the birht of tea ceremony, they decorate the wall of tea house by hanging the old calligraphy. Until this tiem, calligraphy was only for nobles, but in Edo era (17-19th century) temple schools were established all over the country and calligraphy spreaded among common people. Confucian and scholars liked Chinese style whole nobles, samurai warriors and common people liked Japanese style. In Meiji eara (from late 19th to early 20th century), official documents were written in Chinese style. There was a boom of construction of monuments with epigraph all over Japan. From mid Meiji era, various calligraphy schools were established, and in Taisho era (early 20th century), calligraphy association was born and exhibition started to be held every year. Now, in the compulsory education, there is a lesson of calligraphy with brush from 3rd grade of elementary school. 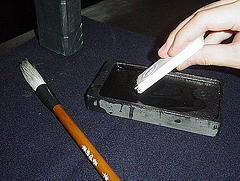 Suzuri (inkstone): Utensil made of stone or tile. There is a hill where you grind the ink, and dip where you contain the grinded ink. Sumi (inkstick): It is made from lampblack fixed with animal glue. You also can buy the liquid ink. Mohitsu (ink brush): It is a writing utensil made of animal hair binded to the bamboo or wooden shaft. We choose either bristle (horse, weasel, racoon, etc) or furry animal (sheep, cat, squirrel, etc). Paper: Writing paper is made by skimming the fiber of the tree such as paper mulberry or gambi. It used to be made by hand, but now produced by the machine. Paperweight: The weight to fix the paper. Mosen: Material made of black felt to be used under the paper. Pour the water to the dip of 'suzuri' and grind the inkstick on the hill mixing water. Put the paper on 'mosen' and fix the paper with paperweight. Dip the brush in the ink and write the character on the paper. When you write 'kaisho', you use 80% of the brush. When you write 'sosho', you use whole brush. Place of arm: When you write a big letter, you must not touch your elbow to the desk. When you write a small letter, you can put your elbow on the desk or on your left hand. How to hold brush: When you write a big letter, you hold the shaft with thumb, index and middle fingers. When you write a small letter, you hold the shaft only with thumb and index finger. How to move the brush when you write stroke and point. Kankakekkoho (Formative theory): How to make balance of the regular script by the space between strokes and combination of strokes. Fuchishoho (Disposition theory): By the disposition of each letters, determining the framework and composition of whole piece in order to make it a work with variation and harmony.